Please don't forget to go vote for me over at 5 Minutes for Mom! 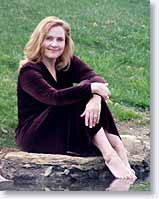 Nancy Moser is the author of three inspirational humor books and eighteen novels, including Solemnly Swear, Just Jane, and Time Lottery, a Christy Award winner. She is an inspirational speaker, giving seminars around the country. She has earned a degree in architecture; run a business with her husband; traveled extensively in Europe; and has performed in various theaters, symphonies, and choirs. She and her husband have three grown children and make their home in the Midwest. It has been said that without George Washington there would be no United States. But without Martha, there would be no George Washington. He called her "my other self." Though still a young woman, Martha Dandridge Custis was a wealthy, attractive widow and the mother of two small children with no desire to remarry. But when a striking war hero steps into her life, she realizes that she is ready to love again. She is courted by, then marries the French and Indian War hero. Yet she wonders whether this man, accustomed to courageous military exploits, can settle down to a simple life of farming and being a father to her children. Even as she longs for domestic bliss, Martha soon realizes she will have to risk everything dear to her and find the courage to get behind a dream much larger than her own. Her new life as Martha Washington took her through blissful times at Mount Vernon, family tragedies, six years of her husband's absence during the Revolutionary War, and her position as a reluctant First Lady. 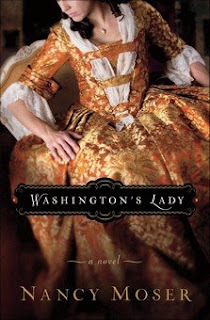 Known for moving first-person novels of Nannerl Mozart and Jane Austen, in Washington's Lady, Nancy Moser now brings to life the loves and trials of the First First Lady of the United States. I'm only a few chapters into this book, but I'm really enjoying it. It's not one that I can read in an evening and I'm not sure why. Perhaps it's because it's so historical I find myself imagining more as I read. The book is told from Martha's point of view and the language she uses fits what I imagine they would have talked like back then. Very proper, yet you still "hear" her thoughts. Since the book covers almost her entire adult life it jumps forward in time quite quickly, but I think I'm going to enjoy this look at the beginnings of our country!